The weeks seem to fly by. Not much happening here. With all the rain and cool weather, I haven’t had the urge to start working on the garden yet this year. The lilacs are in bloom under my bedroom window. It is too cold to have the windows open. The last few years I have been able to have lilac scented breezes drift in as I sleep. Maybe next year. My favorite rose bush has a lovely scent too. 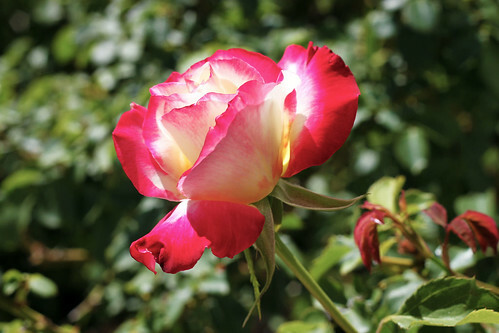 Here is the first rose of 2010. I am still plying around making mastery workbook samples on Belle. Everyday I get more enamored by this sewing machine. I have been filling squares of fabric using all the different decorative stitches with lots of different types and weights of thread. The machine will stitch in the same holes over and over again, without jamming. It is amazing. I even put metallic knitting yarn in the big bobbin. I like the gold metallic flowers made using a star stitch in the sample below. If I were to do this sample again I would do things differently. The thread color is too close to the fabrics for one. I also cut some of my fabric strips too short and got weird angles. Next time crazy quilting should go better. I was using odds and ends of fabric and was more interested in how the machine worked, so I just finished it this way. I need to move on to the next mastery workbook sections or I will never get through them all. Here is the applique sample. 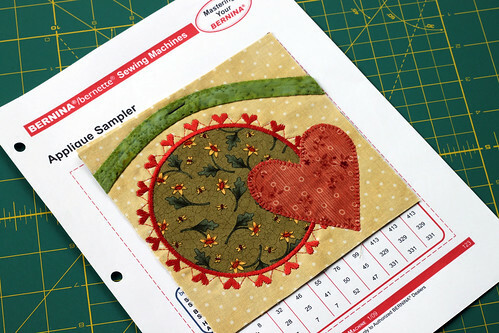 I used the circular attachment for the reverse applique circle. I want to play with this tool some more too. When I get to the Embroidery Workbook I hope my samples are more interesting. I want to try to do some videos too. I wish I could show how the decorative stitches can be manipulated. I can spend all day trying them this way and that. 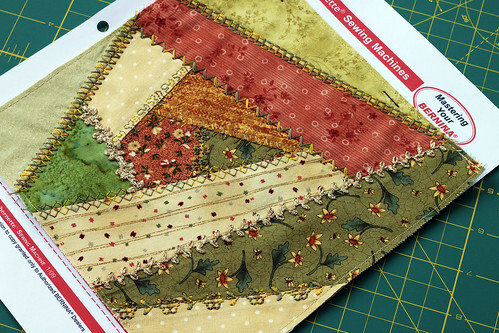 This entry was posted on Saturday, April 17th, 2010 at 1:01 pm and is filed under Bernina 830, Garden and Sewing. Tagged: Sewing. You can feed this entry. You can leave a response, or trackback from your own site. 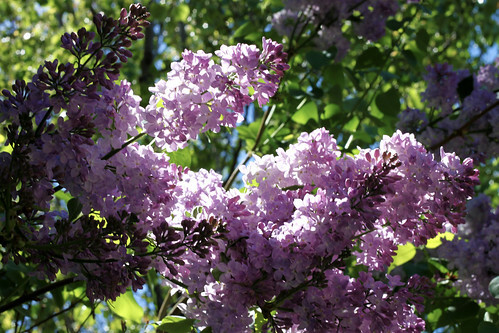 Beautiful lilacs and rose… I can’t wait until mine begin to bloom. It’s amazing that you were able to use yarn in your bobbin! It came out great too….love the look. The applique sample is very precise. I really like the hearts around the circle. Belle is performing so well under your hands! We had a few days in the 80’s. I got all happy and bought a tomato plant. Last night was 34 degrees. the tomato is living on the window sill! What a heavenly rose and your lilacs are so far ahead of ours -it will be weeks before we get to that point! Love your sample of the circle of tiny hearts! Have a good week and how about sharing some of that rain…our fire warnings are unusually high right now because it is so terribly dry.